It is quite extraordinary to be confronted with three highly typical and well-preserved examples of the work of Johannes Theodorus Cuypers, all dated between 1802 and 1807 and proudly signed in true Stradivarian style with his age of 78 in the cello and 83 in the two violins of 1807, made the year before his death. Johannes was born in Dornick, just within the western border of Germany, but seems to have worked all his life in The Hague. He was the father of two violin making sons, who followed in his mannered style very closely. His only known predecessor in The Hague was the French maker Jean Joseph Wattier, a maker of the ‘Vieux Paris’ school, who may have provided Cuypers with his first instruction, since his work does indeed reflect a shared preoccupation with Stainer, also seen most closely in the violins of Guersan in Paris. Cuyper’s commonly repeated title ‘the Dutch Stradivari’ probably has more to do with his productivity and long life, and there is little in his style to connect him with the great Cremonese other than the lower arching forms he adopted later. His sons Johannes Franciscus, born in 1766, and Johannes Bernardus, born in 1781, certainly played their part in their father’s workshop, especially Johannes Franciscus, who worked for a considerable time in Amsterdam from 1783, and probably brought back fresh ideas to the family shop in the Hague. One hundred years earlier, Amsterdam had been one of the best northern European centres of Violin making, with a flourishing community of very refined and strongly Cremonese-influenced makers like Jacobs, Kleynmann, Vand der Seyden and Verbeek; but by the mid to late eighteenth century, the leading maker was probably Jean Baptiste Lefebvre who, as his name suggests, was of French origin, and brought a strong Mirecourt flavour to his making, with the first hints of Stradivarian ingredients. It is not too difficult to see an influence there, reaching through the young Joseph Franciscus Cuypers into the Hague workshop. On these later Cuypers instruments the arch is certainly very Stradivarian, and some scrolls show the black edging Stradivari introduced in the 1690s. 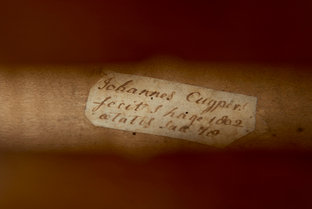 The cello is dated 1802, the label stating Johannes Cuijpers/ fecit s’Hage 1802 and under written aetatis suae 78, and remains firmly in the Stainer tradition. With a full, boxy arch, truncated corners, and appropriately Tyrolean soundholes, it is a deft adaptation of Stainer’s model. Cuypers signature work is seen chiefly in the scroll, which has a very small, squashed oval volute. The turns have a distinctly conical shape from front and back view, and the undercut and fluting is shallow and not elegantly shaped. The whole instrument is clothed in a very full and undisturbed varnish coat, of a typical creamy golden yellow colour. Beneath the varnish, the maple is particularly handsome, with a broad figure and close grain that probably denotes imported wood. Of the two violins dated 1807, with Johannes age again inscribed but this time as aetatis suae 83, one is more identifiable with the cello than the other. Both are made with a single piece backs of sycamore or local wide-grained maple, used by a many English makers, in contrast to the maple wood of the cello. The arching of both violins is certainly that of an Amatise 1685 period Stradivari; low but with a noticeable and elegant recurve towards the edges. But there the comparisons with Stradivari end. The first violin shows the hand of an older man. The soundholes are cut with a slightly unsteady grasp of the knife, the bass side ‘f’ leaning inward, the treble distinctly upright. The distinctive Cuypers purfling meets in a very pinched, short and randomly directed mitre. There is the same, characteristic scroll with small, oval volute and a very square, flat chin. The fluting is shallow and stops short on the front face of the scroll. The varnish is identical to that of the cello, and is again remarkably pure and well-preserved. On the last violin of this trio, the work seems more vigorous and youthful, and it is more than a fair bet that the young Johannes Franciscus was a significant contributor. In real terms, the similarity between the two violins is astonishing, although possibly no more than might be expected with two instruments made in the same year in the same workshop. Even the material of the back is virtually the same, although here the figure is narrower, less regular and almost horizontal. But the subtleties, the tiny glimpses of a fresh imagination at work in the fluted and more symmetrical soundholes, the cleaner, more circular and Cremonese looking volute of the scroll and the sharper working of the throat, all contribute to a very distinctive character in this instrument. It’s not the devil in these details, but the pleasure in seeing different personalities bound up in the making of essentially very very similar objects, and interpreting their place in the historical record.